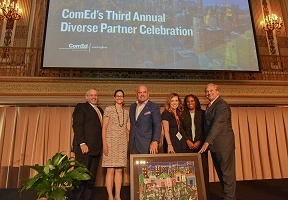 Seven local companies owned and led by people of color and women were recognized for excellence in construction and professional services, environmental stewardship, community building, job creation, and more at ComEd’s third-annual Diverse Supplier Awards ceremony on Monday. In 2017, ComEd spent $711 million – 36 percent of its total supply chain spend – with diversity-certified suppliers, an increase from 33 percent of total supply chain expenditures in 2016. It established 111 new diversity-certified supplier relationships last year for a total of 478. In the past seven years, ComEd spent $3.3 billion with diversity-certified suppliers, providing new opportunities for African-American, Hispanic, Native American, veteran, and women-owned enterprises. 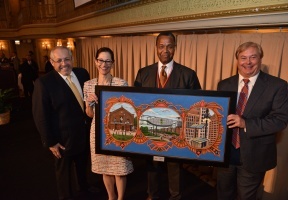 Seventy-eight companies competed for the awards presented at the Palmer House Hilton Chicago. • Overall Performance for Construction and Material Services: United Scrap Metal, Inc., Cicero, Ill., innovative recycling solutions. • Overall Performance for Professional Services: KDM Engineering, Chicago, engineering and telecommunications consulting. • Rising Star Award: Livewire Electrical Systems, Inc., Calumet Park, Ill., electrical contracting, safety inspections and construction. • Go Green Energy Sustainability Award: Zones, Inc., Carol Stream, Ill., IT hardware, software, and related services. • Diversity Advocacy Award: Meade, Inc., La Grange, Ill., design, construction, and maintenance of electrical power and natural gas distribution systems, and telecommunications technologies. • Community Partnership Award: MZI Group, Inc., Chicago, electrical and mechanical construction, energy infrastructure, design build, and facility services. • Transformation Award: The Will Group, Chicago, lighting fixtures assembly and testing, system assessment, and pole manufacturing.